Looking for a calorie dense snack you can keep in your pocket? 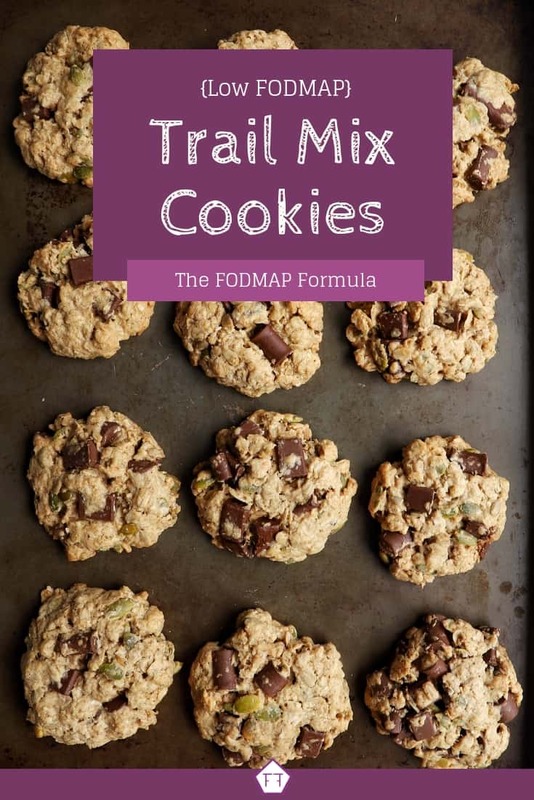 Try these low FODMAP trail mix cookies. Packed with FODMAP friendly nuts and seeds, they’ll fill you up while you bop around town. 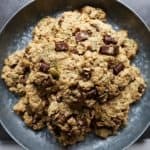 Packed with protein, these low FODMAP trail mix cookies are a great breakfast on the go or a filling post-workout snack. Just so we’re clear, I usually put chocolate chips in mine to balance out my workouts. I highly recommend it. 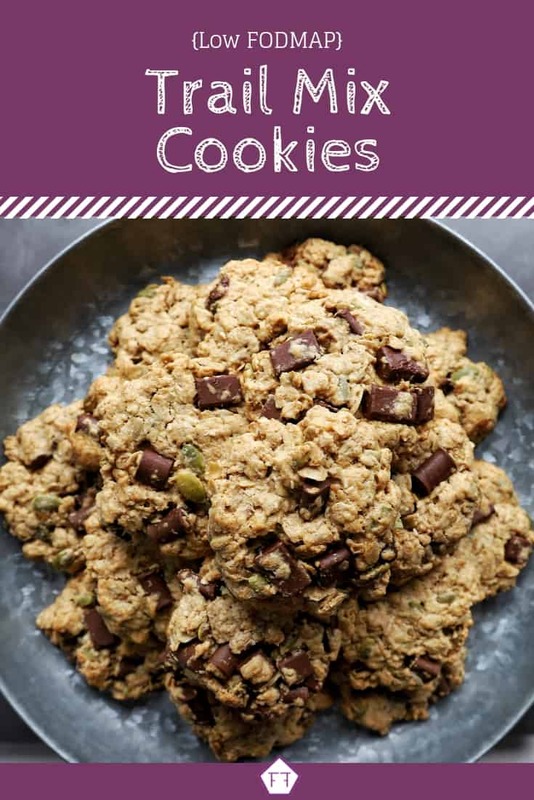 These trail mix cookies are also freezer friendly so I normally make more than one batch at a time. Don’t worry about defrosting them, though. They thaw almost instantly, so they’re ready to go when you are. Think these low FODMAP trail mix cookies sound great, but you don’t have time to try them now? You can PIN THIS POST for later. There are a ton of moving parts in this recipe, so check out the notes below for tips on keeping these low FODMAP trail mix cookies FODMAP friendly. First, let’s talk about oats. According to Monash University, oats are safe in portions of up to 1/2 cup. 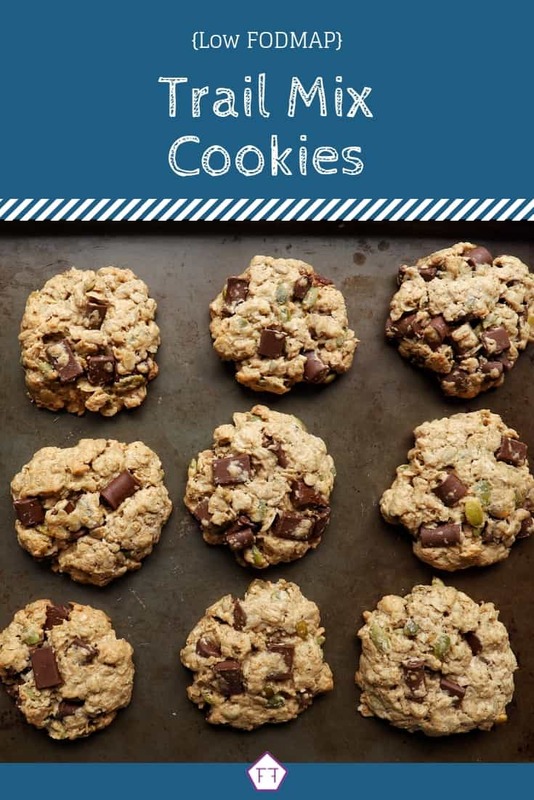 We use 2 cups of oats for this recipe, which works out to 0.8 tbsp of oats per cookie. This is well within the recommended range. Next up is seeds. This recipe uses pumpkin and sunflower seeds. Both of these are low FODMAP in servings of 2 tbsp per sitting. We use 1/2 a cup of sunflower and pumpkin seeds in this recipe. This works out to 0.4 tbsp of each seed, or 0.8 tbsp of seeds total per cookie. This is well within Monash’s recommended serving size. This recipe also uses peanut butter. Monash recommends using 100% peanut butter. Processed brands often add milk, sweeteners like xylitol, and other high FODMAP ingredients. It’s much easier to use pure peanut butter. According to the Monash app, peanut butter is safe in servings of 2 tbsp. 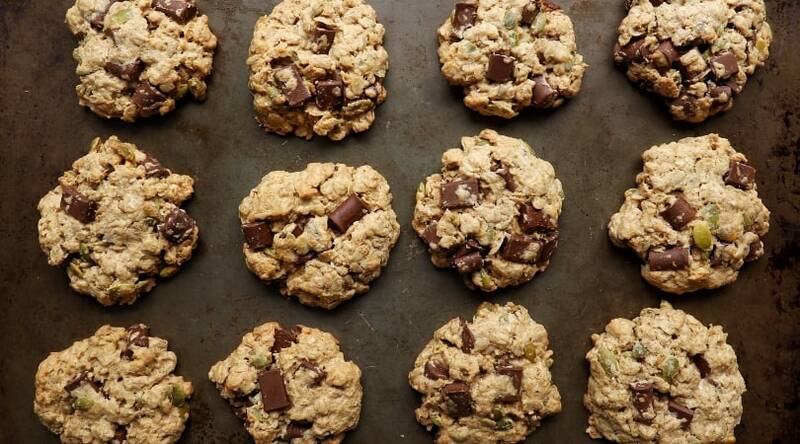 Our trail mix cookies use 1/2 a cup of peanut butter for the entire recipe. This works out to 0.4 tbsp per cookie which is well within Monash’s recommended serving size. Our final ingredient is coconut. Monash University says coconut is safe in servings of 1/4 cup. We are using 3/4 cups for this recipe, which works out to 0.6 tbsp per cookie. This is well within Monash’s suggested serving size. Because there are so many ingredients in these cookies, I normally stick to two cookies per sitting. They’re really filling, so you probably won’t need more than one or two to fill you up, anyway. 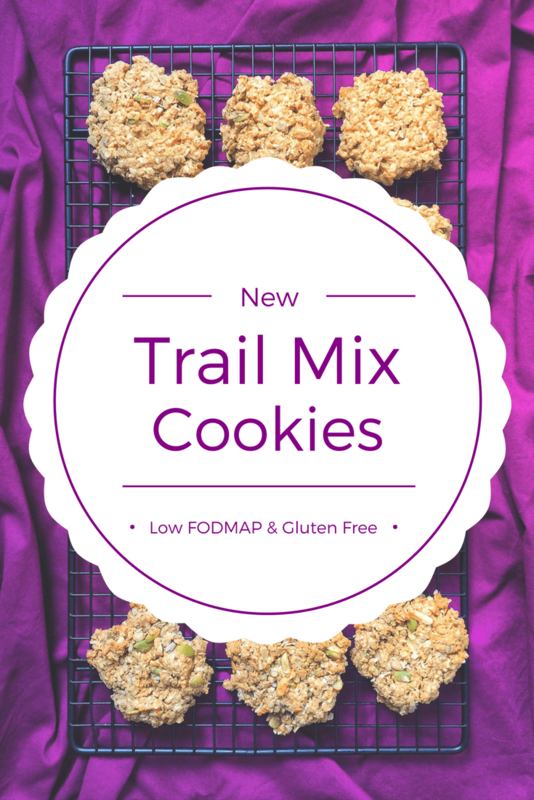 Want to try these low FODMAP trail mix cookies? Don’t forget to PIN THIS RECIPE for later. Looking for an easy FODMAP friendly snack? Try these low FODMAP trail mix cookies. Packed with protein, they make a great breakfast on the go or a filling post-workout snack. Place olive oil, oats, and seeds in a large pot and toast over medium heat. Once you can smell them, dump the oats and seeds onto a large bowl to cool. Melt your butter in the heated pot and set aside. Add flour, coconut, cinnamon, baking powder, baking soda, and salt into the cooled oat mixture. Stir gently to coat oats and seeds with flour and seasoning. In a separate bowl, mix together eggs, vanilla, melted butter, peanut butter, and sugar. Stir until the mixture is smooth. Place your dough onto the cookie sheet (about 2 tbsp per cookie). They won't spread, so make sure you pat them down with a spoon until they're the thickness you want. Bake each tray individually for 8-12 minutes. Cool cookies on a wire rack then seal in an airtight container or freeze. These low FODMAP trail mix cookies will help you power through your busy day. If you like this recipe, sign up for my mailing list below. You’ll get new recipes and articles delivered right to your inbox. If you need more recipe ideas, you can sign up for the monthly newsletter in the sidebar. 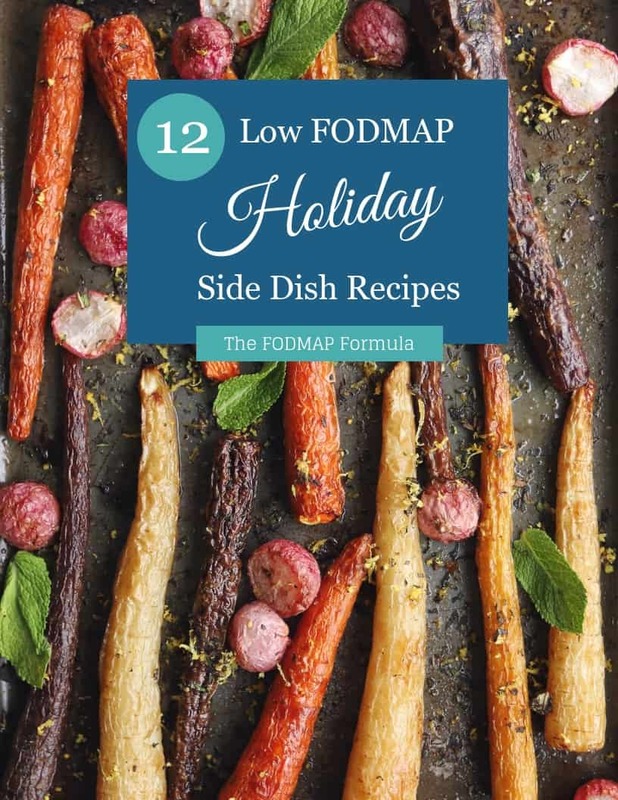 You’ll get a round-up of the recipes posted each month as well as seasonal and holiday ideas. You can also follow me on Pinterest for even more recipe ideas. I made these today and they were so good! I had to make a few subs just b/c I didn’t have all the ingredients (pumpkin seeds, coconut, etc) but stuck with the basic ratios and they were on point! 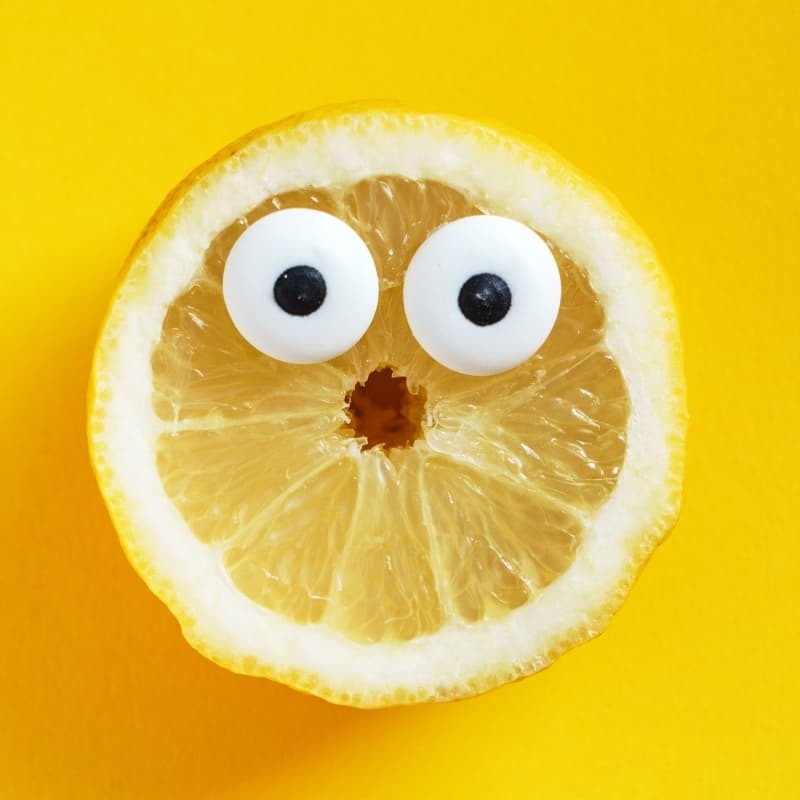 I’m super excited to be able to have a satisfying snack now that is IBS-friendly.